There are a lot of sump pumps on the market, which claim to be the best at draining water off the flooded basement but being the best does not necessarily mean they can be used in all settings. Buyers need to be clear about where the pump will be placed and what they expect the pump to do in certain area. For instance, if you are going to pump water off your basement which often gets clogged up, how much debris and what kind of debris do you expect the pump to deal with? 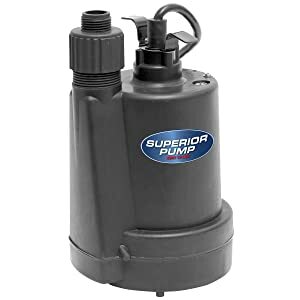 If you are looking for a submersible sump pump that can handle debris without overheating then the Superior Pump 91250 1/4 HP Thermoplastic Submersible Utility Pump is the ideal pump to use. This is a small and impressive pump. It is a versatile pump that can be used in most common household spaces. You might need to keep an eye on it because it does not have the float switch to activate the off button when its finished pumping water out but this can be separately ordered if you really need to have a float. The great thing is that the pump can run dry without overheating. This pump can be used to pump water out of sumps, flooded basements, backyards, a small pool, and a clogged up bathtub. This pump is quite durable and can typically last from three to four years, depending on the content of the water it sits in and the amount of corrosion it develops internally and externally. Its versatile nature allows it to work as an emergency or back up pump, just in case the primary sump pump sitting in the pit fails to work properly. This pump can handle the most difficult jobs with ease because of its design. The long lasting thermoplastic casing ensures that the pump is not only light but that it is durable and protected from corrosion. The pump can pump 30 gallons of water per minute. Moreover, it is very quiet when humming, and produces a low sound. It does get a little noisier when moving water to a higher elevation, however it’s quite surprising to see how much water it pumps out without sounding like it’s grinding it out. It is equipped with a mesh cover to trap debris. It can run for hours without overheating. It has a good vertical lift capacity that can go beyond the standard 10ft. lift that most pumps have. Has an effective ¼ horsepower, split capacitor motor. In case you are looking for a pump that can drain your murky pool or drain water out of your basement then this little pump is more than capable to do just that. The standard 10’ long cord which comes with the pump is quite stiff and is made of material that becomes inflexible under cold weather. However, it coils up better when the sun is up. The electrical cord that comes with the pump is not flexible enough. The pump does not come with a float switch to turn the pump off when the water has been drained. Also, some users were concerned that the throughput of the pump was not anywhere close to the figure advertised. At best, the pump drained off water at 300 gallons per hour which is less than half of what was advertised. While this pump may not be as heavy duty as the other pumps in its class, it works as advertised. Several reviews mention that it has proven extremely useful and durable and the price makes it a great deal. And, given its usefulness, construction, and value, it’s only fair to give this sump pump a high rating!